Goldcar car hire in Javea, Spain. Do you need a car hire from Goldcar in Javea? Then you can use our search engine for rental cars below and get the best price on your rental car. 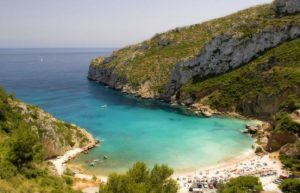 Compare offers from Goldcar and the other car hire companies in Javea in one simple search. Goldcar is one of the leading car hire companies in Spain, mainly aimed at the tourism industry. Goldcar has been around since 1985 and has grown from a small family business with only five cars, to today’s car fleet of 50000 cars and 39 Goldcar offices only in Spain. The province of Alicante, with offices at Alicante Airport, and the train station, San Juan, Benidorm and Denia, continues to be the flagship of the Goldcar brand. Goldcar offers cars of all sizes and price ranges, from Smart cars, to large luxury Mercedes models. According to the company, over 70% of the fleet is renewed annually, and the average age of a car rental from Goldcar is only 10 months. The investment for Goldcar in the tourism industry accounts for 95% of sales. 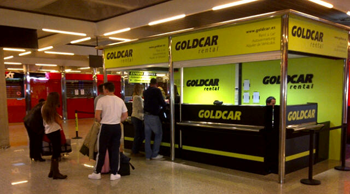 The typical customer is foreign and carries a rental car through Goldcar’s offices at the Spanish airports. Goldcar is well represented on the most popular destinations in Spain. Goldcar has 30 years of experience in the market. A renewed fleet of over 50,000 cars. Availability of booked car is guaranteed. No overbooking. 24/7 directions in several languages. Address: Carretera del aeropuerto S / N Terminal 1 Hall de llegadas.